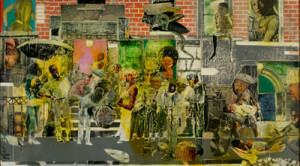 WEST PALM BEACH, FL —- In conjunction with Black History Month, the Norton Museum of Art is hosting its first Black History Family Day, highlighting art by African American artists, telling their stories, inspiring visitors to make art, and featuring music and theater by African American performers. The event, sponsored by PNC Arts Alive, is free and runs from noon to 5 p.m. on Saturday, Feb. 24, 2018. The day’s highlights begin at 12:30 p.m. with a presentation by Everee Jimerson Clarke, author of Pleasant City, West Palm Beach. She will discuss the history of the community and sign copies of her book. Ellen Roberts, the Norton’s Harold and Anne Berkley Smith Curator of American Art speak on From Bannister to Bearden: African American Art at the Norton Museum of Art. The talk highlights artworks by sculptor Augusta Savage, who spent her youth in West Palm Beach before becoming a leading figure in the Harlem Renaissance; Beulah Ecton Woodard, a contemporary of Savage’s, as well as artist Romare Bearden and 19th-century painter Edward Bannister. Bearden’s extraordinary collage, On Such a Night as This (1975) will be on view. Other contemporary artists on view, including Mickalene Thomas and Hank Willis Thomas (no relation), will be the subject of gallery conversations led by members of the Norton’s Teen Advisory Squad (TASQ) A focus exhibition of paintings and drawings by Jean-Michel Basquiat, who introduced graffiti to the art world in the 1980s, will also highlight this special event, and will be on view through March 18. Families also can participate in hands-on art-making activities led by local artists, including Lupe Lawrence. Fiber artist Kianga Jinaki will host a workshop exploring African and African American textile tradi-tions; painter Khaulah Naima Nuruddin leads a workshop where guests can create art mash- ups of words and images, inspired by works in the Basquiat exhibition. An outdoor stage at the Museum entrance will feature a variety of performers, including hip-hop artist Eric Biddines. Wayne Perry, a.k.a. Mr. Trombone, will perform his brand of soulful jazz and serve as MC for the afternoon. Spoken word artist Abasi Hanif, accompanied by two drummers, will lead a public drum circle (and provide some additional drums for those who want to participate). Student ensembles from area schools will also be featured on stage. The afternoon will be capped by a performance of The Core Ensemble’s Ain’t I a Woman! For years, the Core Ensemble has created “Chamber Music Theater” highlighting remarkable historical figures. This performance features actress Deltoiya Goodman celebrating four significant African American women: ex-slave and fiery abolitionist Sojourner Truth, novelist and anthropologist Zora Neale Hurston, folk artist Clementine Hunter, and civil rights worker Fannie Lou Hamer. The accompanying music, Core Ensemble members explain, is inspired by “spirituals of the Deep South, the urban exuberance of the Jazz Age, and concert music by African American composers… “Free, general admission tickets to the performance will be available at the Museum’s Visitor Services desk on a first-come, first-served basis on the afternoon of the performance. The performance is recommended for ages 12 and older. Jean-Michel Basquiat: Drawing into Painting Feb. 8 – March 18, 2018 Organized by the Norton Museum of Art. On loan from private collections, the Norton showcases the celebrated art of Jean-Michel Basquiat featuring Dogman, a classic painting from 1986, along with four revealing drawings. Together they provide insight into the artist’s stylistic development and his integration of symbolic, cultural, and historical references to create his powerful art.